How will small business be affected by the new £5 note? How small business will be affected by the new £5 note? We were fascinated to read recently about the design of the new £5 note, which will be issued by the Bank of England in September. In May 2017 paper £5 notes will cease to be legal tender and will no longer be accepted by shops and banks. New £10 and £20 notes will then follow in 2017 and 2020 respectively. The new £5 note will be 15% smaller than the existing note, and will be made of polymer instead of paper. This is to make it more wearable, ensure it doesn’t tear, and also make it waterproof. 21,835 notes were replaced in 2015 due to damage, and the new polymer notes are expected to last up to 2.5 times longer than paper. This all contributes to making the new note better for the environment, in that fewer will need to be produced and and therefore less energy will be used in manufacturing and cash transportation. The polymer notes can also be recycled when they reach the end of their life. The Bank of England have released a video showing more about the new £5 note. You can view it HERE. Check whether your small business operates any cash handling machines - including self-service check-outs, desktop counters, ATMs, ticket machines, and any other machine that weighs, counts, sorts, accepts, dispenses or recycles banknotes. If so you need to contact the supplier of your machines to discuss what adaptations will be required for the new £5 note, and when they will be available. For most machines, a software update will be needed. Implement adaptations to your machines before 13 September 2016, when the new £5 will be issued. Train your staff how to handle and recognise the new note. 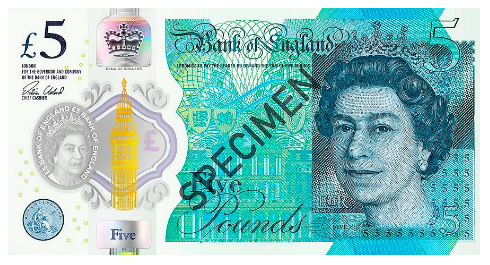 The full design and security features of the new £5 were unveiled on 2 June 2016, and a range of materials to support staff training are available HERE. Keep up to date with the latest information about polymer banknotes, and other banknote news, by registering with The Bank of England HERE. The introduction of the new £5 note is a massive change for both our society and our small businesses. On the one hand it confirms the continued existence of cash in our increasingly cashless world, and on the other it brings the technology of cash firmly into the 21st century. Be prepared for these changes so that there is no business interruption as a result of them!